Take This 7 Day Rose Challenge For Better Skin AND Digestion ! It’s fair to say that roses smell pretty darn amazing. I’m not much of a flowery kind of gal myself, but my senses are a sucker for any bed of roses in full bloom. That wonderfully sweet, silky floral scent issuing from impossibly bright petals simply can’t be ignored, and there’s no denying that it’s a thing of beauty. But most people make the mistake of thinking that copping an eyeful and a heady noseful is as far roses go. Until recently, I found myself in this woeful group, unaware of the many impressive health and wellness benefits that can be had simply by steeping or distilling the essence of a rose. In other parts of the world, however, roses are viewed in an entirely different light. In the Middle East, where roses have been cultivated and admired for thousands of years, roses are used for a wide range of medicinal, beauty and culinary delights (ever heard of Turkish Delight? It’s made with rose water). Cleopatra is said to have incorporated roses into her legendary beauty routine, and in the 1st Century AD Roman naturalist Pliny the Elder recorded 32 different medicinal uses for roses. Clearly, there’s more to the humble rose than meets the eye — or nose, for that matter. High-quality, natural products made from roses, especially the mighty Damask rose, can bring a lot of nourishment and joy into your life. In this post, I’ll start by delving into some of the awesome health and beauty benefits of rose-derived products like rose oil and rose water. Then we’ll begin the seven-day rose challenge, helping you to make roses a part of your daily routine and make your life a whole lot better in the process. If you didn’t like roses before, you will by the end of this challenge! While rose water and rose oil are relatively uncommon in America and other Western countries, their popularity in many parts of the Middle East, Asia and Southeast Asia is anything but. In these parts of the world, the essential oil and infused water of the Damask rose is prized for its wonderful fragrance, anti-inflammatory properties, nutritional profile and versatility as a beauty product. And there’s a good reason for this. A 2011 review of the pharmacological uses for Damask rose found that it contains a heady mixture of therapeutic compounds, including terpenes, glycosides, flavonoids and anthocyanins. By extracting these powerful natural compounds into oil or water, a potent health-giving elixir is created. Here’s just a sample of what the research says extracts of the Damask rose can do for your health. A 2008 study published in the Journal of Natural Product Communications tested the stress-alleviating effects of rose oil on 40 volunteers. Applying rose oil to the skin was shown to cause significant decreases in breathing rate, blood oxygen saturation and systolic blood pressure, all of which are elevated in a state of stress. Volunteers also reported feeling more calm, more relaxed and less alert than those in the control group. A 2011 study took this one step further, showing that inhalation of rose essential oil (through aromatherapy) actually helps to alleviate some of the more nasty symptoms of chronic stress. While more research is needed, scientists believe that the quercetin and kaempferol present in rose extracts create a significant analgesic (pain-alleviating) effect in the human body. A 2010 study showed that a hydroalcoholic extract of Damask rose dramatically reduced inflammatory pain in mice, and that this effect is likely to be experienced in humans as well. Who would have thought that the wonderfully fragrant rose you’re sniffing could also cure cancer? While that might seem a little far-fetched, the research begs to differ. A 2011 study examined the effect that Damask rose extract had on human cervical carcinoma cells, finding that it decreased cancer cell viability and had the potential to bring about the death of malignant cells in cervical carcinoma. The therapeutic abilities of roses just keep getting better. Research suggests that extracts of the Damask rose have beneficial effects on brain function and may help to prevent the development of degenerative neurological disorders like Alzheimer’s disease. A 2011 study showed that Damask rose extract prevented the formation of neurite outgrowths and inhibited neuronal cell death; a technical way of saying that roses can protect the brain against the development of Alzheimer’s. Skin tonic: rose water has a gentle astringent effect, helping to prevent the clogging of pores and inhibit the formation of acne. Natural deodorant: rose essential oil contains farnesol, a volatile aromatic compound that prevents the growth of bacteria and thereby stops bad smells in their tracks… whether those smells are issuing from your trainers or your pits! pH regulator: rose water has a pH similar to that of healthy hair, so rinsing your lovely locks with a dash of rose water helps to keep your hair looking shiny and lustrous. Skin protector: rose essential oil is loaded with vitamin C and other antioxidants, helping to protect your skin against sun damage, aging and oxidative stress. Dark circle destroyer: many people apply chilled rose water under their eyes in the morning to banish dark circles and discoloration. The list goes on, but you get idea: roses are more than just a nice smelling flower! Now that you’ve had just a taste of what roses can do, you should be raring to go. And I have just the thing: a seven-day rose challenge to immerse you in the wonderful world of roses and show you how to integrate them into your daily routine for improved health and beauty. Let’s get started! Most conventional cleansers are loaded with all manner of nasty chemicals in their desperation to remove as much dirt, oil and makeup from your face as possible. According to many, rose water removes just as much grime and makeup, but without all the chemicals! Not only that, it leaves your face smelling wonderfully fresh and slightly floral. Simply moisten a cotton ball or clean washcloth with pure rose water, then gently wipe your face with it just before bed. Earlier in this post, we explored how rose oil is a scientifically proven way to unwind, relax and de-stress. Participants in rose oil trials reported how they felt calmer and less alert after simply dabbing a little rose essential oil on their skin… so why not use it as a way to calm your mind and body before sleep? You have two options: if you have an essential oil diffuser, place a couple of rose essential oil drops in the diffuser with water and allow the sweet aroma to fill your bedroom just before bed. Either that or simply rub a small amount of rose essential oil on the back of your hands and dab a tiny amount under your nose before going to bed. I’ve come across several well-known makeup artists who swear by rose water as a way to “set” makeup and powder in place. After applying your makeup, simply place a little rose water in a spray bottle and spritz some onto your face. Easy! These days, kombucha is all the rage. This fermented tea is prized not only for its refreshing flavor and natural fizz, but for the beneficial probiotics it contains. But kefir, or so I’m told, is even better! While kombucha contains a still-respectable four strains of bacteria and three strains of yeast, kefir is said to contain a whopping ten strains of bacteria and four of yeast. That’s a huge jump up in the probiotic benefits. Throw in some anti-inflammatory, antioxidant-rich rose water, and you’ve got yourself a delicious, nutritious, probiotic-rich beverage. Pour the coconut water into a large sterilized glass jar. Add the kefir grains and rose water, and give a gentle stir. Cover the jar with a tea towel or cheesecloth and allow to stand at room temperature for one to two days, depending on how strong you like your kefir. Remove the kefir grains and store in the fridge. The natural antibacterial properties of rose essential oil, combined with its deliciously subtle floral scent, make it a great centerpiece for a chemical-free, homemade deodorant. For my own personal supply, I mix together 1 tablespoon of virgin coconut oil (at room temperature, so it’s liquid), 1 teaspoon of baking soda, a drop of peppermint essential oil, and 2 drops of rose essential oil. I place the DIY deodorant into a small lidded jar, then simply dip a finger in and rub it into my pits after showering. The antioxidant, anti-inflammatory and anti-bacterial properties of rose water make it a great choice for healing all manner of skin issues. Store a small bottle of rose water in your medicine cabinet, and use it to speed healing of scratches, wounds and scars, or dab it onto stretch marks to encourage tissue regeneration and diminish their appearance. The bioflavonoids, terpenes and antioxidants found in rose essential oil can be utilized to nourish your skin and lock in the moisture. To make a simple, effective DIY moisturizer, mix together 2 to 3 drops of rose essential oil with 1 tablespoon of either coconut oil, olive oil or almond oil. These oils not only act as carrier oils for the rose essential oil, allowing it to penetrate deeply into the skin, but they also possess their own hydrating, nourishing abilities. Generously massage your DIY rose moisturizer anywhere that needs a bit of TLC, and give your skin a much-needed vacay! 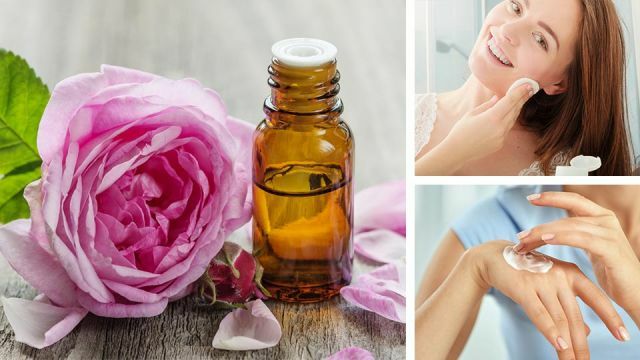 While we’ve covered off a decent chunk of what you can do with rose water and rose oil, there are plenty of other awesome health and beauty benefits that are yet to be discovered. Tell us how much you loved the seven-day rose challenge, and whether you’ve discovered other wonderful ways to bring a little more rosey goodness into your life! Hey Buddy!, I found this information for you: "Take This 7-Day Rose Challenge For Better Digestion, Skin And More". Here is the website link: https://www.thealternativedaily.com/take-this-7-day-rose-challenge-for-better-digestion-skin-and-more/. Thank you.